All about collecting antique stocks and bonds from North American railroads. 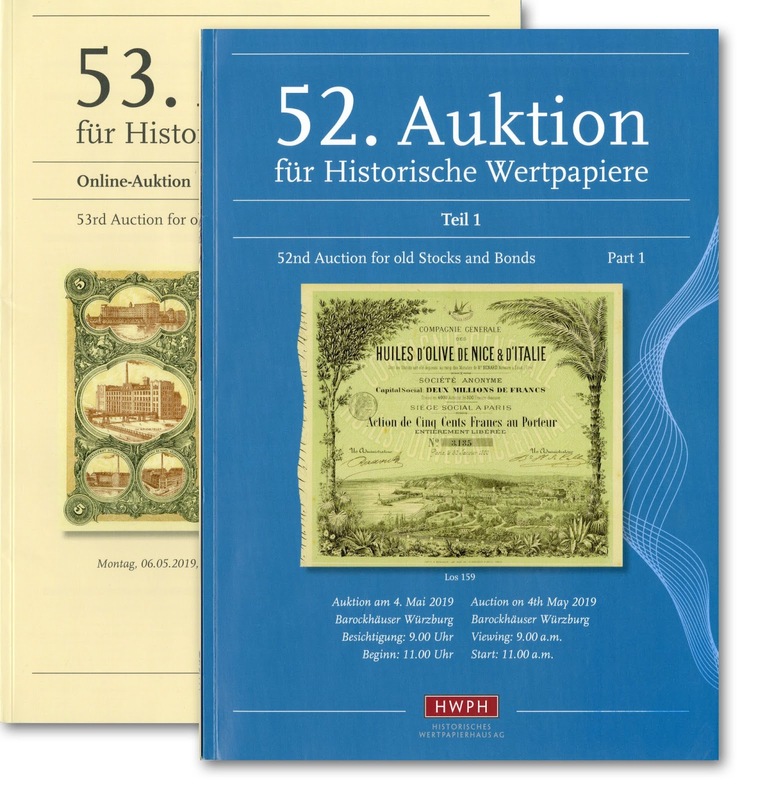 Historisches Wertpapierhaus AG (HWPH) will stage two sales on Saturday, May 4 and Monday, May 6 at Barockhäuser in Würzburg, Germany. Bidders may participate in person or by mail, fax or online. Full-color catalogs for the sale are available by contacting HWPH by email at auktion@hwph.de or through its website at the link above. All lots are viewable online with full-color images larger than those possible in printed catalogs. Online bidding is conducted through the Invaluable bidding platform, so make sure you register for bidding beforehand. While my readers will no doubt find many other items of interest, I count 75 lots that directly involve North American railroads. Advanced collectors will be familiar with the vast majority of company names, but upon closer inspection they will spot several scarce varieties, some of which are new or have not been seen for years. For instance, take lot 67 from the highly familiar Chicago Great Western Railroad Company. While the 10-sh stock certificate looks familiar, it is actually a previously unreported variety of a stock trust certificate. The certificate was issued to Prince Ferdinand Philipp Maria August Rafael of Saxe-Coburg-Gotha, himself a famous German collector in the early 1900s. Lot 71 is from the Hartford & New Haven Rail Road Co, another highly familiar name. The 1850 stock certificate, however, is a new variety of "Extension Stock", not previously known to me. 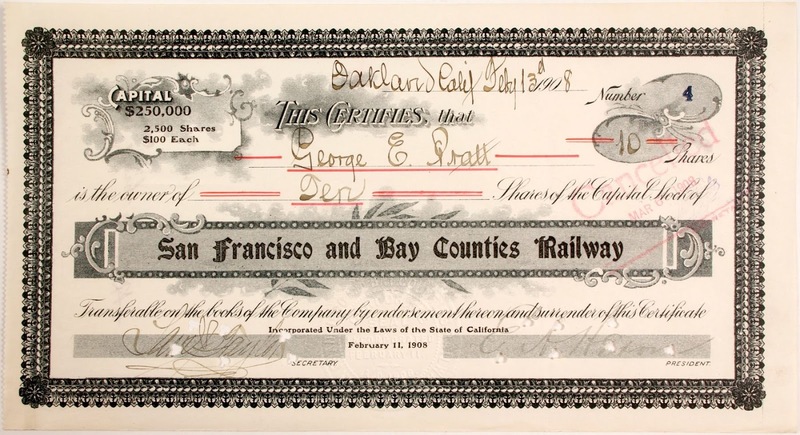 Everyone familiar with North American railroads has seen images of stock certificates from the Mount Tamalpais & Muir Woods Railway Co with its great view of San Francisco Bay through the trees. Unlike all of them, lot 77 appears to be the first uncancelled example. (The catalog does not specifically mention whether it is cancelled or not.) Don't tell anyone, but even if cancelled, the start price is low by comparison to a recent sale price of a cancelled example in a Holabird auction of Ken Prag's collection. There is also an example of an 1857 stock transfer from the New York & Harlem Rail Road Company. This would seem to be an unimpressive offering except for two things: this is one of only two examples of this variety known to me. AND the transfer records a sale of stock to Cornelius Vanderbilt and Daniel Drew. This is historic connection to be sure. Observers will note that I do have this transfer recorded in my catalog, based on an auction appearance 27 years ago! The large vignette of a horsecar makes this 1900 stock certificate from the Rome City Street Railway Company (lot 91) quite recognizable. Again, its familiarity is deceptive. This certificate was issued after the company raised its capital from $50,000 to $150,000 in 1900. This lot is the only issued example to come to my attention. All the other examples with the capital alteration are unissued. That's probably not a big deal to the majority of collectors, but where else are they going to find another issued example? Then there is a blue version of a 1915 stock certificate from the Western Railway of Havana, Ltd. (lot 102.) The certificate carries no vignette, so the lot does not seem important – except for the fact that it is a previously unknown variety. Lot 112 is another transfer I recorded many years ago. It is a transfer from the Mohawk & Hudson Railroad Company dated 1836 and signed by William Blackhouse Astor. I'm pretty sure Astor is no longer signing certificates like this. For those collectors still searching for an autographed certificate from James Longstreet, take a look at lot 113 and an 1871 stock certificate from the New Orleans & North Eastern Rail Road Company. Many collectors are going to notice the previous certificate, but the familiarity of lot 660 will probably cause many collectors pass on by. This lot is a $10,000 bond from the Cincinnati Indianapolis St Louis & Chicago Railway Co, and is currently represented by 25 or so examples. There might be another fifty of them out there somewhere. This particular certificate, however, is one of three currently known that were issued to Thomas Alva Edison and signed by him twice on the back in his highly distinctive style. Maybe worth a second look? Of more normal appeal is lot 1957, a vertical format bond from the New York Susquehanna & Western Railroad Company. This bond shows a famous American Bank Note Company vignette of four miners and a huge mine car outside of a coal mine. The vignette is most often seen on stock certificates from the Acadia Coal Company. What makes this bond significant, however, is that it is one of only four to come to my attention in over thirty years. As I do with most auctions I review, I beg collectors to act early if they are interested in bidding on rarities. And even if they are not going to bid, they need to be aware of all their options and what other collectors are bidding on. At least take the time to visit the HWPH website. I guarantee there is a lot more world out there than the fiefdom of eBay. 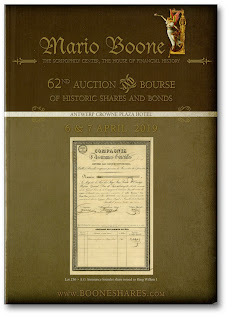 Mario Boone's latest sale is fast approaching, offering 1,622 certificates from across the globe. Of that number, I count sixty rail-related certificates from North America. 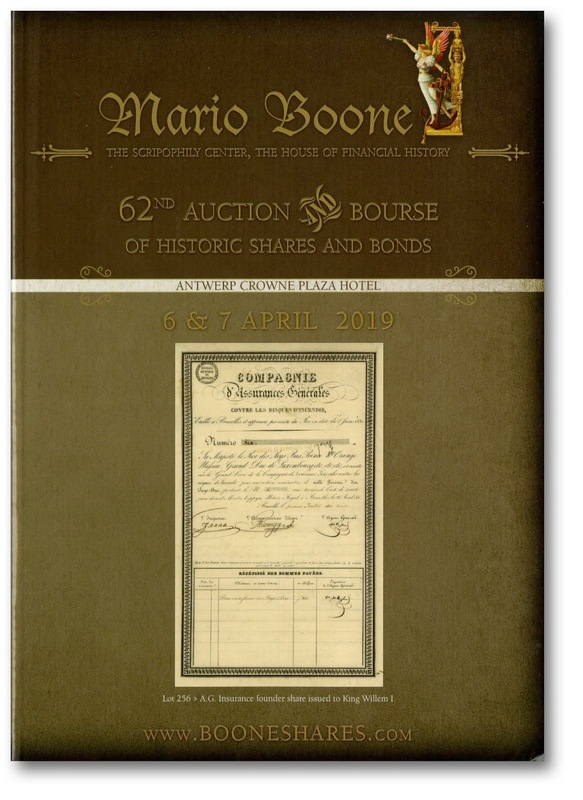 Mario's sale will take place at the Crowne Plaza Hotel in Antwerp, Belgium Saturday, April 6 followed by the largest Euopean stock and bond bourse on Sunday. Even if you already receive the physical catalog, I recommend you view images of the lots online at www.BooneShares.com. The Euro is currently trading at a 13.7% premium to the dollar. Coupled with the auction commission, prices will seem a bit higher than Americans may be used to. For that reason, I feel compelled to remind collectors that there are many lots in this sale that are exceedingly rare in North America and may not be seen again for many years. By "many year," I mean ten, maybe even twenty years. Having said that, I stress that high rarity does NOT necessarily translate into high price. Therefore, don't be afraid to take a chance. Here are a few standout rarities that I noticed. You will probably see others that I missed. United Railroads of Yucatan Inc (lot 1466). A specimen of a £200 bond dated 1910. Possibly unique. The Mexican Electric Power & Tramway Co (lot 1465). 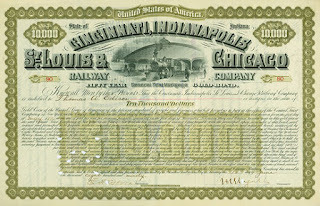 A possible unique 1908 preferred stock certificate. Madison & Indianapolis Rail Road (lot 1491). An 1852 stock certificate that is the only fourth of its variety known to me. I have not seen this variety offered since it first appeared in 2011. This company controlled track a stretch of track that remains the steepest non-cog railroad grade in North America. Huntingdon & Broad Top Mountain Rail Road & Coal Co. A scarce purple variety of an 1863, $500 bond. New Jersey Rail Road & Transportation Co. (lot 1503). This is an 1870 stock, not horribly rare, but seldom seen and offered with a low start price. Peach Bottom Railroad Co. (lot 1507). An 1882, $100 bond. I know of only five bonds from this company. Every time I have seen it sold, it has seemed underpriced relative to both rarity and desirability. But what do I know? Pittsburgh Fort Wayne & Chicago Railway Co. (lot 1511). This is an 1885, odd-share stock certificate. I have cataloged other certificates from this company with the same design, but this is a new color and denomination. The Coxsackie & Greenville Traction Co. (lot 1520). An 1899, $1000 bond that makes only the fourth example known to me. Wabash Chester & Western Railroad Co. (lot 1534). A 1920 stock certificate and only the second certificate to come to my attention. Point Arena Railroad Co. (lot 1571). This certificate is a star of North American rail-related certificates. Certificate #1 with train and boat at pier in wide vignette of Point Arena. (Point Arena is a hundred miles north along the Pacific Coast from the Golden Gate Bridge.) 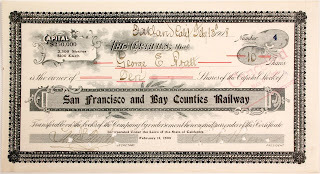 This certificate was issued to the company president and dated 1881 at San Francisco. This example is considered the only certificate known from this company. REMINDER. See the home page at www.booneshares.com for registration and bid deadlines. DO NOT PUT OFF until the last minute !! Titled A Sale to "Die" For, Holabird Western Americana Collections will conduct its latest sale over a span of five days, December 5 to 9, 2018 in Reno, Nevada. The sale is titled such because the centerpiece of the sale is a large number of token dies from the Northwest Territorial mint. Having said that, the dies are but a fraction of the sale. Like Holabird's other sales, the range of collectibles is wide, much wider than I have space to relate. With 5,752 lots being offered, you simply need to get one of of Holabird's full-color catalogs to see for yourself. 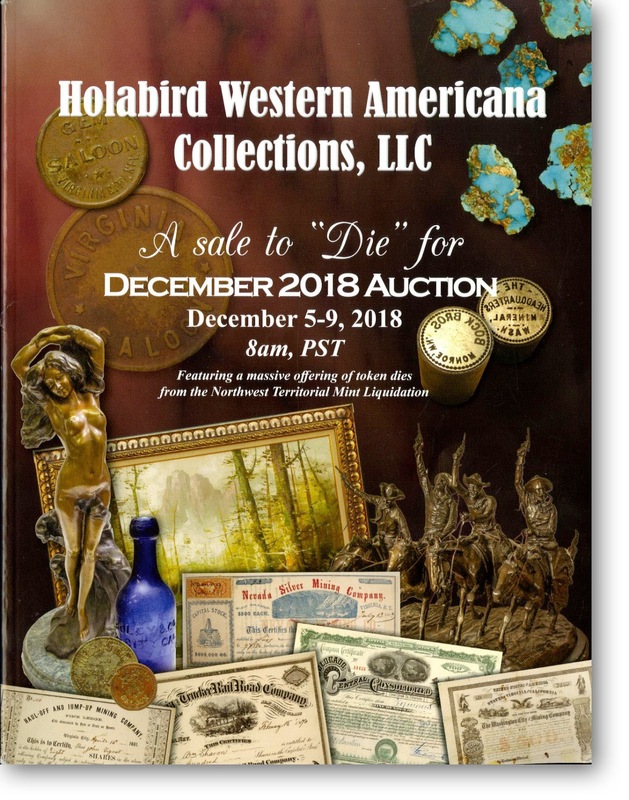 I contend that if collectors can't find something desirable in this - or other Holabird catalogs - I'm not sure they are really collectors of historic items. Of course, my interest is telling you about railroad certificates. There are a lot of them in this sale, but even their number pales in comparison to the number of mining certificates offered. Most, possibly all, of the railroad certificates in this sale were amassed by San Francisco scripophily dealer and collector Ken Prag. Holabird began liquidating Mr. Prag's collection in his October sale. I apologize, but I was so thoroughly involved in getting the third edition of my catalog published, I did not have time to review and write about that sale. In fact, it took me over a month to catalog every certificate offered. This time, I put everything else aside to see what kinds of certificates were coming up for sale. While the railroad portion of the sale is still two weeks off, the number of railroad certificates being offered is so large that I can only hit a few of the high points. I will leave the in-depth digging to my readers because everyone's interests are so varied. Railroad certificates can be found in lots 5234 through 5752. These lots will go under the hammer starting on December 9, the fifth day of the sale. While I strongly recommend getting a copy of the physical catalog, you can start with a virtual version found at at FHWAC.com. Day 1 items can be found here, or you may go directly to Day 5 to find all the rail-related lots. Eliminating a handful of non-certificate items, I count a total of 496 lots of railroad certificates. While the majority are single-item lots, 144 lots feature two or more certificates. Unlike multi-item lots in most other sales, Holabird's multi-item lots contain closely-related certificates, normally from the same company. Counting all certificates in all lots, the 'Sale To Die For' will offer 779 railroad certificates. I specifically mention multi-item lots because there are some hidden gems there that you probably will not expect to find. I won't have time to examine every one of those lots for at least a couple more weeks, but if this sale is anything like the last, you will find some sensational rarities if you look closely enough. I make this prediction this because I recorded 22 (!) entirely new varieties in the last sale from multi-items lots alone. Don't be too quick to ignore multi-item lots. It is only to be expected that many certificates will appear familiar to advanced collectors. Take the well-known but rare certificate from the Alaska Central Railway Co. with a map occupying the green background of the entire certificate (lot 5245). Almost every railroad specialist has seen pictures of it, but I have recorded only 17 serial numbers up until now. When cataloged, this lot will contribute the 18th example and it will be the earliest known so far. On the other hand, how many collectors have examples of the Alaska Midland Railway Co (lot 4246) in their collections? Or the Boynton Bicycle Electric Railway? It you're the person who collects certificates with serial #1, check out rarities like the Lookout Incline Railway (lot 5456) and Los Angeles & Vernon Street Railway (lot 5458). Or how about a stock certificate from the Silverton Railway signed by Otto Mears (lot 5622)? It will become only the second such certificate I have recorded from this rare company, both signed by Mears. I went through all images of single-item lots in this sale, looking merely for certificates that struck me as unusual. Within about twenty minutes, I spotted five certificates that I have not encountered since recording them from unillustrated lots in the 1990s. This makes the first time I have encountered illusive certificates from the Arlington & Fairfax Railway, Blue Ridge Traction, Indian Valley, Lewiston Nezperce & Eastern and the Palatine Lake Zurich & Wauconda. I also stumbled across the first instances of certificates from companies like the Pascagoula Street Railway and Power Co., the Portsmouth Kittery & York Street Railway Co., the San Francisco & Bay Counties Railway, the Stamford & Northwestern Railway Co. and the Allentown Passenger Railway. Stressing again that I have not yet cataloged a single item, I also noticed certificates from two entirely new companies: the Mine Hill Railroad Co. (lot 5482) and the Pacific Coast Express (lot 5493). Also new was an unissued municipal bond from the City of San Francisco sold to aid the San Francisco & San Jose Rail Road Co. (lot 5605. There is also another entirely new municipal aid bond from the Corporation of the City of Brownsville, Tennessee (lot 5364) that was issued in 1870 to aid an unspecified railroad. What new certificates and companies hide among the multi-item lots? No idea. I figure I will not have time to check every item before the sale takes place. Hopefully, you will. If wondering when you will see these in the Coxrail database, look for them in the mid-December database update. While some of these items appear for sale a few times per year, I have already alerted you to a few items that probably won't appear more than once or twice per CENTURY. If you miss them now, you are unlikely to ever have a second chance. Like recent sales, Spink is grouping most of its stocks and bonds in multi-item lots. While this is not particularly good for collectors, these lots would make good additions to smaller dealer inventories. 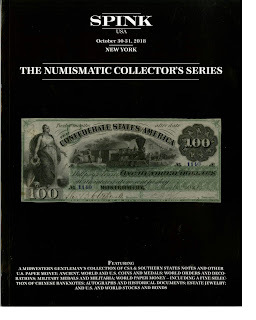 Only two of the lots are illustrated in the physical catalog, but all scripophily lots are illustrated online at Spink.com. 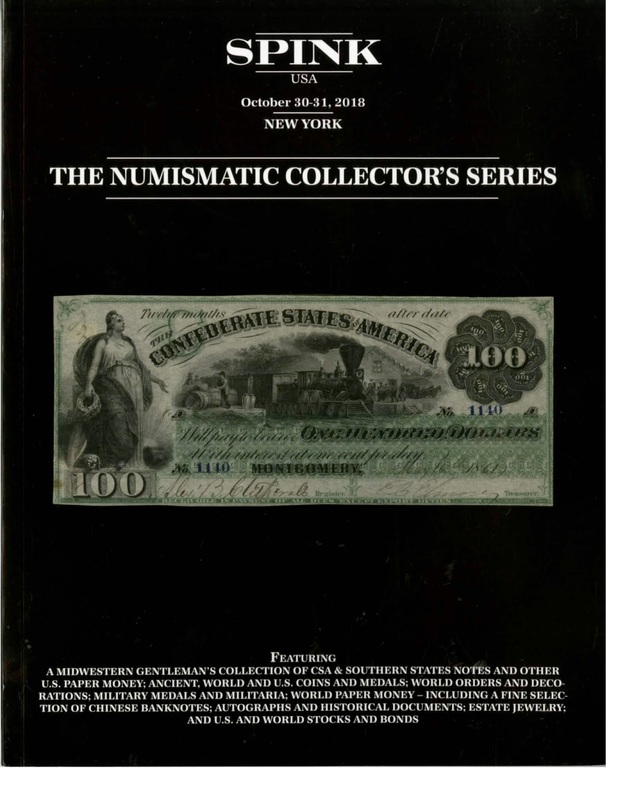 Because of the wide array of items offered in this and similar Numismatic Collector's Series sales, collectors will find many highly interesting lots that they would not ordinarily encounter. Those are precisely the kinds of collectibles most people will overlook if not thumbing through the physical catalog. Consequently, that is precisely why I always recommend acquiring catalogs from professional auction sellers such as Spink. However, if only viewing online, then browse offerings of railroad certificates by searching for lots 1079 through 1092, 1099 and 1112A. I just received a new catalog from Mario Boone and discovered it offers 102 lots in the North American railroad specialty. I did not keep count when I entered all the information in my database, but it appears that at least half of his offerings are represented by ten or fewer examples. I do not want this point to go unnoticed. 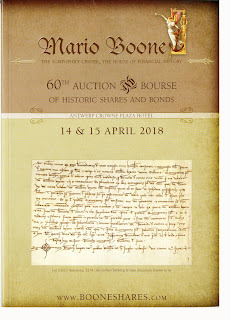 There are LOTS of certificates in auction 61 that you may not have the opportunity to acquire for several years, if ever again. Yes, you will see some long-time favorites like Ferro Monte Rail Road, Gilpin Tramway and Wat-Chung Railway, but there are a few that I have never seen before. At least part of these offerings seem to have originated from a collection of one of my long-time correspondents. However, I have no idea where most came from. 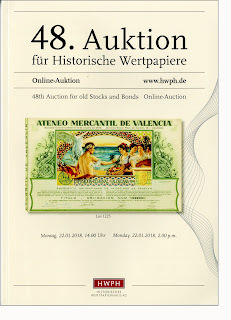 The best thing I can do is suggest you acquire a copy of the printed auction catalog. Failing that, please visit booneshares.com and look at items there. I know there are not a lot of Cuba specialists out there, but eighteen lots represent Cuban railroads. With the exception of certificates from the Cuba Railroad, most Cuban certificates are quite scarce. If you happen to collect certificates from Cuba, please don't miss out. Lot 1037 is a stock certificate from the Western Railway of Havana, Ltd. and is the only certificate I ever encountered. That particular certificate was last offered in Germany in 2008. Equally rare is a specimen from the Banco del Comercio Ferro Carriles Unidos de la Habana Almacenes de Regla (lot 1038), last seen in a 1993 Smythe sale. There are only five railroad lots from Canada, but among those is a stock certificate from The Cape Breton Railway Extension Co, Ltd. While the company is not new to me, this is the first time I have actually seen an image. Rare? It seems like it to me. Obviously, I don't have the space to relate every rarity. However, here are a few. In parentheses are the numbers I have encountered since the late 1980s. Like any other super-rare collectible, there is always a possibility that additional unreported examples may exist somewhere. But I wouldn't get my hopes up. Note also that Lot 1227, is a serial number 1 certificate. 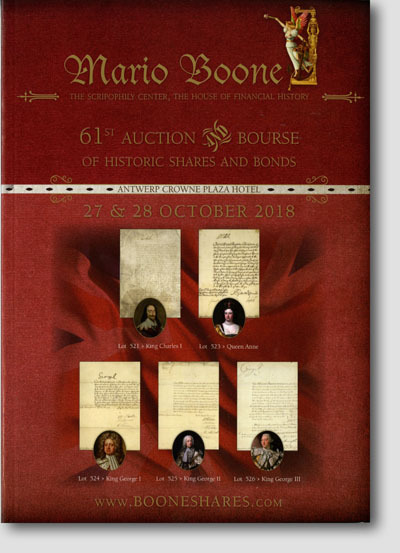 Auction 61 will take place at the Crowne Plaza Hotel in Antwerp, Belgium, October 27 and 28. The deadline for submitting absentee bids is 8 pm, October 26. I stress once again that there are a bunch of rarities in the sale that probably will not be seen again in the next ten years. Please visit Booneshares.com as soon as possible. Mario Boone’s next auction is scheduled for April 14 in Antwerp and will feature yet another great selection of American railroad rarities. As usual, he features stocks and bonds from around the globe, all arranged by country. The unquestioned highlight of this sale is a Spanish banking and loan document dated 1279 (!). 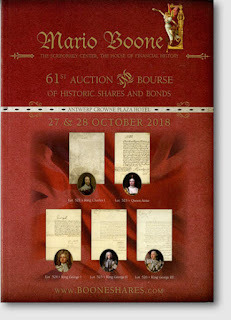 If you are in the market for a 739-year old rarity then, chances are, you already have the catalog for Auction 60 and have planned your bid. I count 81 rail-related lots from the U.S. plus eight more from elsewhere in North America. I ask you to get online quickly at www.BooneShares.com and look for certificates in your specialties; you are bound to find several pieces of interest. I will mention a few items that caught my attention, either because they are the first I have seen or they APPEAR to be unique or extremely rare. 1901 debenture from the Cuban Central Railways, Ltd. (lot 1607): new to me. 1902 gold bond from the Havana Electric Railway Co. (lot 1608): only the second issued bond I have recorded. 1911 bond from the Havana Terminal Railroad Co. (lot 1613): another item I have never encountered before. 1851 stock from the Rochester & Syracuse Rail-Road (lot 1694): the second serial number known to me. 1865 stock from the Schuylkill & Dauphin Improvement Railroad Co (lot 1703): first recorded. 1872 stock certificate from the Schenectady & Susquehanna Rail Road Co (lot 1709): the second one to come to my attention in 30+ years. 1889 stock from the St Augustine & Halifax River Railway Co (lot 1729): first stock certificate that I have recorded for this company. 1890s specimen stock certificate from the Schenectady Railway Co. (lot 1732): if not unique, then nearly so. 1893 issued stock certificate from the Kaaterskill Railroad Co (lot 1739): while familiar in unissued form, this is the first issued example I have encountered. 1905 uncancelled stock certificate from The South Omaha & Western Railroad Co (lot 1753): serial #1 and still the only example I have ever recorded. 1915 uncancelled stock certificate from the New York & Queens County Railway Co (lot 1760): so far, only one known to me. 1947 stock certificate from the Salt Lake Rail & Bus Terminal Co (lot 1771): although recorded before, this remains the only certificate I know from this company. The word unique means one of a kind; the only one in existence in the entire world. Unless there is some sort of definite proof, I am exceedingly reluctant to speculate that any certificate is truly unique. And I hate to say that another will never appear. ALL of us have been surprised more than once. 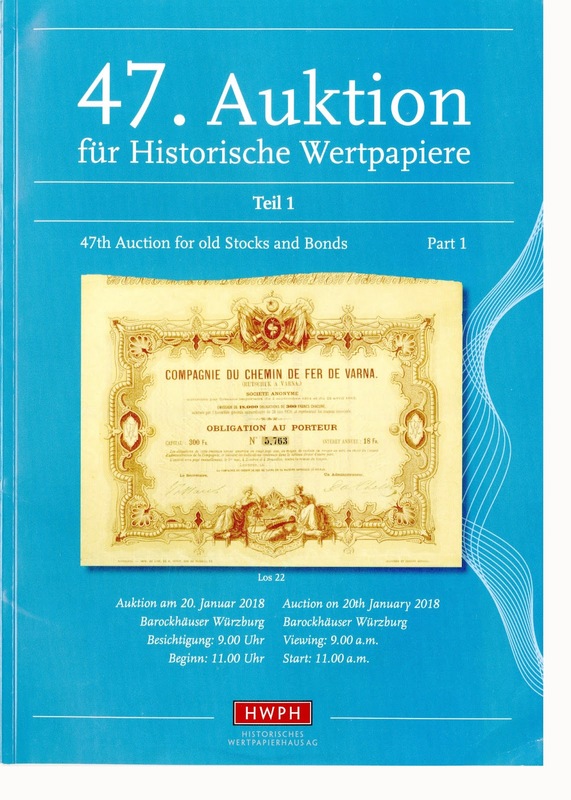 Nonetheless, based on thirty years of recording over a million offerings of railroad stocks and bonds, I will suggest that several items in this auction APPEAR to be highly rare. Therefore, if sold, I believe we are unlikely to ever encounter several of these certificates again in our collecting careers. Please visit www.BooneShares.com or email to receive a copy of this 263-page, full-color catalog. And yes, I know that commissions, VAT, postage and the declining value of the dollar relative to the Euro are penalties on American collectors. No argument there. But, what value do you place in your quest? And how many of these items do you expect to ever see again? For collectors of American railroads, online Auktion 48 is more enticing. 60 of the 2,398 lots involve American and Cuban railroading. About half are seen very rarely in the United States and are not the kinds of certificates any experienced collector should hope to find on eBay. For that reason, I suggest collectors take a serious look at this sale. 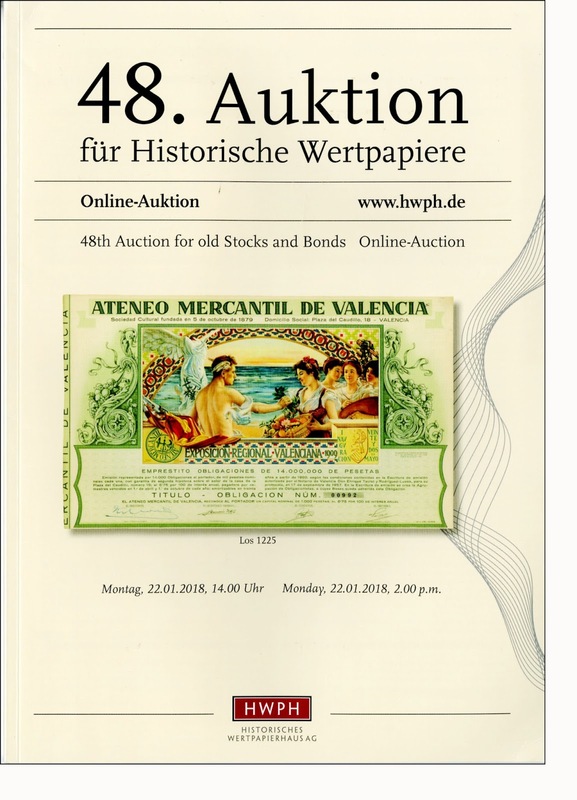 Several certificates in this sale will not be seen again in the next decade, so I will mention a few that caught my attention. Several collectors will recognize a $1000 bond from the Brooklyn & Brighton Beach Railroad (lot 2064). One of these certificates appears for sale every couple of years, but the number of collectors who want one routinely pushes auction prices over $150. It is more elusive than its familiarity might suggest. Certificates from the American Car & Foundry Co should also appear familiar, but the 100-share certificate offered in this sale (lot 2032) is much scarcer than most people realize. Similarly, a 1908 $1000 bond from the Chicago Subway Company (lot 2079) is another infrequently-seen beauty that might be overlooked. Labeled 'Brunswick & Albany Bahn', the certificate in lot 2066 is a certificate of deposit is one of only five I have recorded. This unassuming certificate was used for bonds deposited with the Brunswick & Albany Committee in Frankfurt in 1872. Only one of the five was sold in the U.S. Lot 2140 is a £250 bond from the Havana Railroads Company, dated 1859 and only the third to come to my attention. Sadly, Cuban railroad certificates seldom attract the attention their rarity might imply. This is especially true of on orange 1-share preferred certificate from the Cuba North & South Railroad (lot 2115). This is a bearer share certificate and I can attest that bearer shares are very uncommon from anywhere in North America other than companies that operated in the Caribbean island. This orange variety is one of only four that I have encountered. However, there is also a green common share companion (lot 2114), which just happens to be the first I have ever listed. Hmmm, I wonder how many collectors are going to realize the rarity (!) 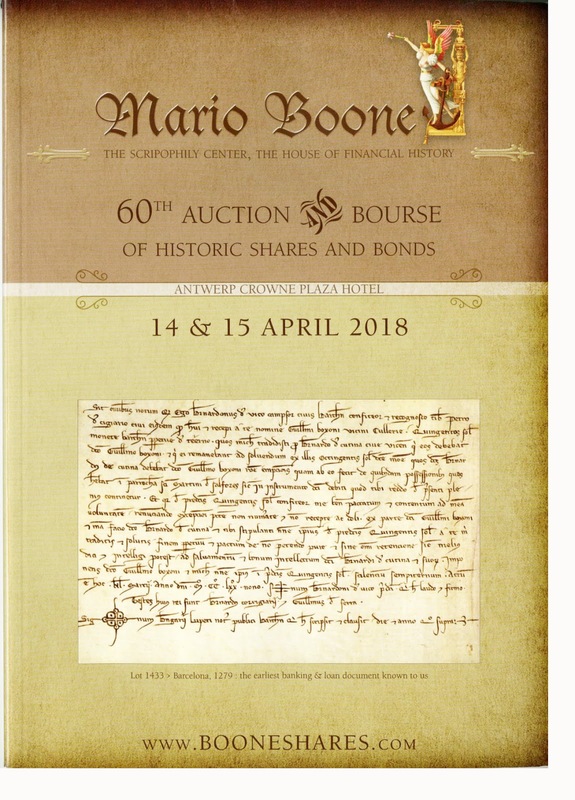 of this certificate, especially considering HWPH's minimum bid is only €140. Another first to me is a warrant from the Erie Railroad to purchase common stock (lot 2126). It is admittedly plain, but still a new item for my catalog. Also the first of its kind is a specimen 1925 equipment trust certificate for $1000 from the Great Northern Railway (lot 2126). Yes, it also is plain. And yes, not very many people collect equipment trust certificates. Still, if a collector is attracted to rarity for the sake of rarity (as many are), he/she should take a look at these kinds of certificates that usually fly under the radar of most collectors. I can't remember exactly when I first started cataloging railroad certificates, but I think it was about 1987. If true, then lot 2169 seems to be rare. It is a $10,000 bond from the New Orleans & Northeastern Railroad Co dated 1917 and only the fourth serial number I have recorded of this variety. No question about it, there are probably more around. After all, there is no way anyone could have listed every railroad certificate offered over the last 30 years by hundreds of dealers in fifteen or more countries. But no true collector should ever call this certificate common! Another uncommon certificate is lot 2081, a 10-share common stock certificate from the Chicago Milwaukee & St Paul Railway, dated 1912. It might look a familiar to the uninitiated, but it is only the third such certificate I know about. Still not impressed? How about a certificate I have recorded only once before? 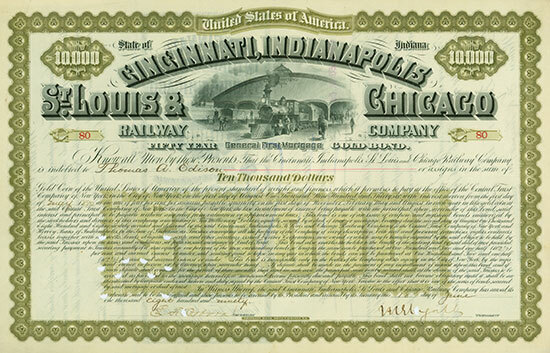 Lot 2150 is a $1000 second mortgage gold bond from the Kansas City & Northern Connecting Railroad. Minimum bid? €100. Finally, do you just want a great vignette? Then look at lot 2082 from the Christopher & Tenth Street Rail Road. Minimum bid: €30. Finally I personally recommend you also acquire the beautiful full-color print editions. This is where I post news and announcements about collecting antique stock and bond certificates from North American railroads. Be sure to visit my main web site at COXRAIL.com. You may also contact me directly. My main site is COXRAIL.com with several hundred pages discussing practically everything I know about railroad stocks and bonds of North American railroads. The free online database currently lists over 26,000 railroad companies and over 17,600 collectible certificates. PAPERMENTAL is my commercial site on eBay where I offer over 1,000 collectible paper items including engravings, newspapers, railroad passes and tickets, magazines, advertising and books. Sales from PAPERMENTAL help support the free Coxrail.com site. Terry Cox is the author of Collectible Stocks and Bonds of North American Railroads. The current edition is the second edition, published November, 2003. 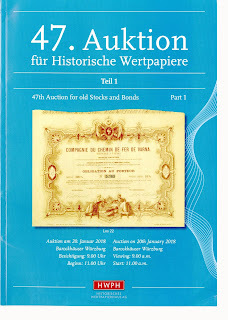 You may purchase the current version from most major U.S. and European scripophily dealers, as well as from Amazon.com.